A Tonk's Tail... err, Tale...: Monday Medical Issues: Da Boyz are Albinos! 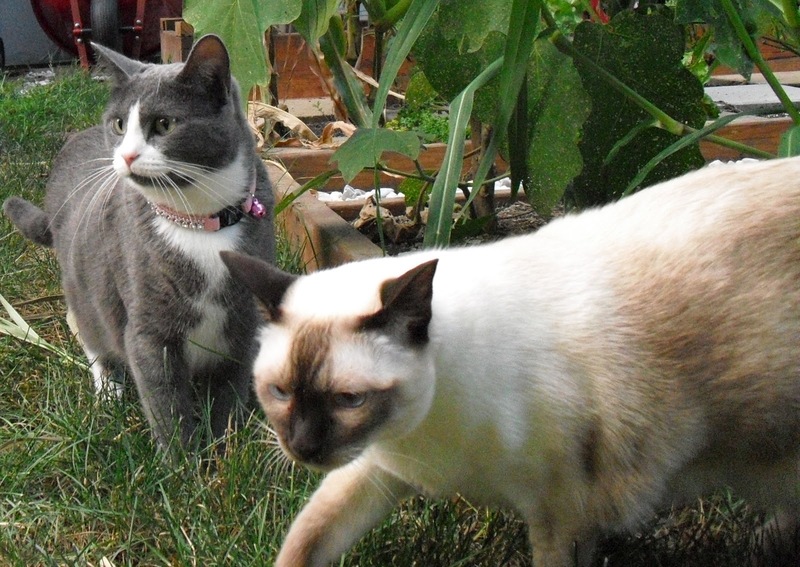 As you may have noticed, Maxwell and Faraday kind of look alike – Maxwell's a Siamese and Faraday’s a Tonkinese. The pointed nature of their coats – darker in the paws, tail, ears – is one of their most striking features. If you discount Faraday’s lungs, that is. Interestingly, that pointed coat is a form of albinism. Wait...da boyz are albinos? Say it isn't so! Okay, it's not so – at least not the way an albino is traditionally understood. When we think of an albino, we usually think of someone without pigment. Well, da boyz aren’t stark white, so what gives? Well, it’s kind of a genetic thing. See, a cat’s coloring is determined by a set of eight different genes. They're what tell a black cat to be black, or an orange cat to be orange. 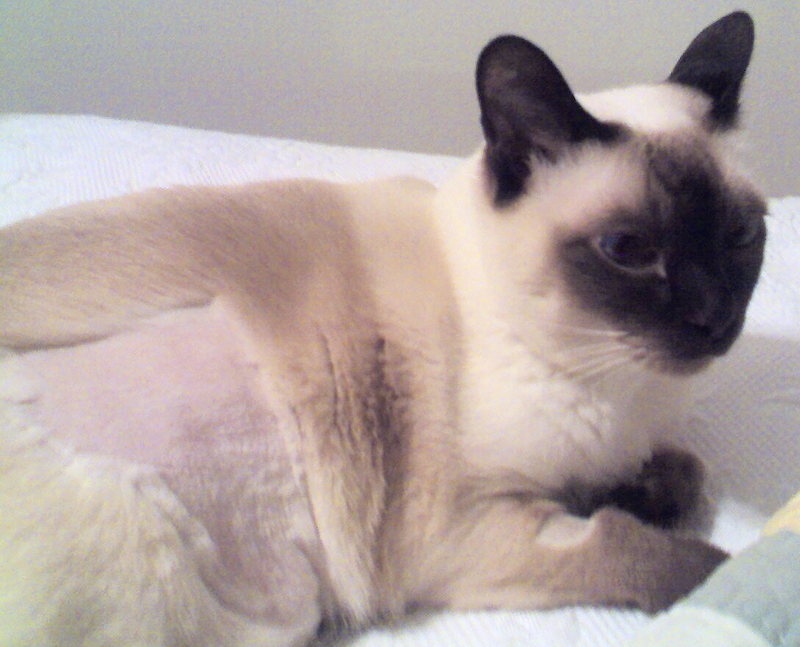 But Siamese, Burmese and Tonkinese cats have something funky going on with one of those genes! Before we get to the funky part, first we need to talk about what a cat gene looks like. Cat genes are made up of alleles – an alternate form of gene – and each gene has two: one from mom cat and one from dad. One special set of alleles in Siamese type breeds sends a command that inhibits pigment – in other words, albinism. Not funky enough for ya? Well, that signal only gets through to a kitty's fur if it's above a certain temperature. So basically what this means is that Siamese, Burmese and Tonkinese cats are temperature-dependent albinos. Kinda cool, huh! Well, the alleles start sending out their "Stop the Color!" message around 38-39.2°C, which is a cat’s standard body temperature. Anything lower than that and the alleles’ message is blocked and the color gene can then do its color thing. Since a cat’s body is cooler around his ears, paws and tail ... that’s where the color begins to kick in. How come these cats are born lighter and then darken as they age? It’s pretty warm in the womb, so all kittens with this special pair of alleles are white throughout gestation. They pop out as white kittens too, but once exposed to atmosphere, their extremities begin cooling. Once they hit that critical temperature, those alleles that have been inhibiting the enzyme responsible for pigment turn off and color begins to develop – on the ears, paws, tail and face. Someone questioned why the face – does that really compute? Surely the face is warmer than the extremities! True, but we have a lot of holes in our faces: eyes, ears, nose, mouth (that was my dad’s big argument, by the way, when I was a kid and wanted to pierce my ears: “you don’t need another hole in your head!”). All those cavities in the head account for enough of a drop in temperature to let the color kick in. Notice Ryker's nose is darkest? Big breathing holes there! And at this stage, his paws were just beginning to get their dark brown color. So let’s think about this for a second. If all it takes to make these cats “go albino” on you is to increase their temp, what if you made Maxwell wear socks? Would his paws turn white? First…good luck with that experiment. Be sure to let me know how that worked out for ya, ‘k? Seriously, if you could actually keep them on him, then, well…the answer is yes. Because coat color is lightened by high body temperatures and darkened by lower temperatures, the color can be altered by a bandage covering the fur, illness, even cold weather. The vet shaved a 4 inch swath around his lower abdomen for a sonogram, and it happened right before we dove into one of the coldest winters on record in Kansas City. His fur grew back a shade darker. (He didn’t think it was very funny.) Fortunately, as spring turned into summer, his coat lightened once again. Ryker, early summer. Dark area is beginning to lighten. "But wait!" I hear some of you say. "Siamese, Burmese and Tonks aren’t the only cats with points!" True. And all of this information can be applied to them as well: Himalayan, Colourpoint, Javanese, Balinese, etc. 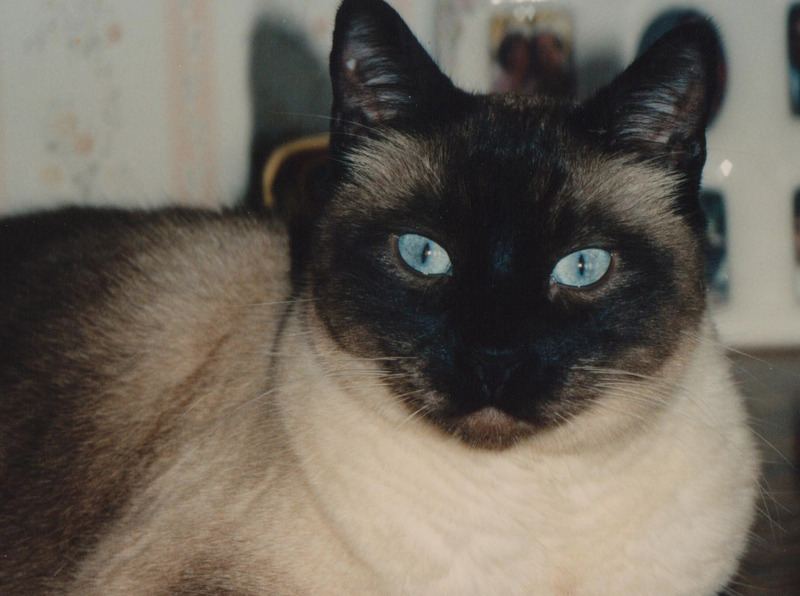 So why specifically focus on Siamese, Burmese and Tonkinese in this article? Blame the scientists. It’s in the naming. 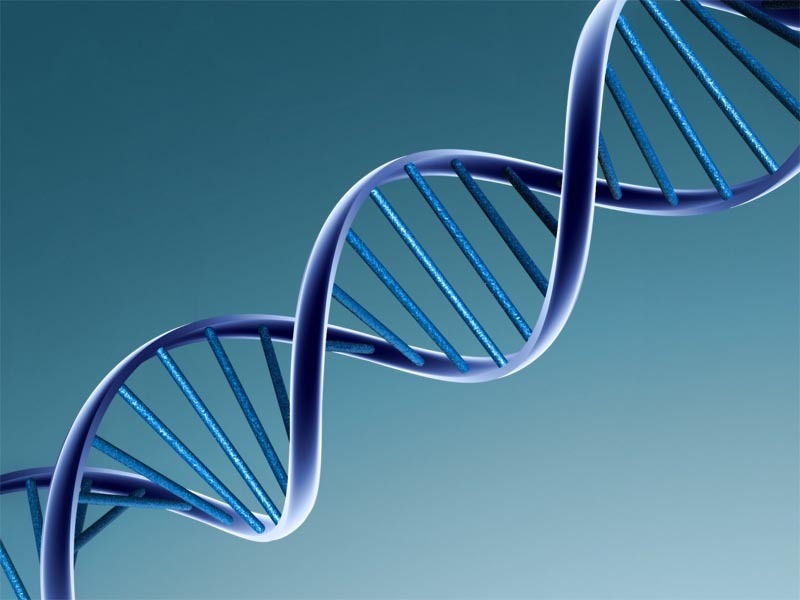 See, the scientists discovered two different alleles (TYR-G301R and TYR-G227W). One is more efficient at turning color off than the other. 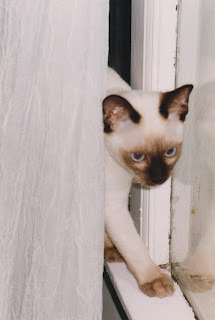 The more efficient one was found first in the Siamese cat, and so those science guys named it the Siamese allele (pairs designated cs cs – the 'c' stands for color, 's' for siamese). The other was found in the Burmese cat, and therefore bears its name (pairs designated cb cb). This makes total sense if you look at pics of both breeds. Siamese have the most contrast whereas Burmese can sometimes have very little contrast. 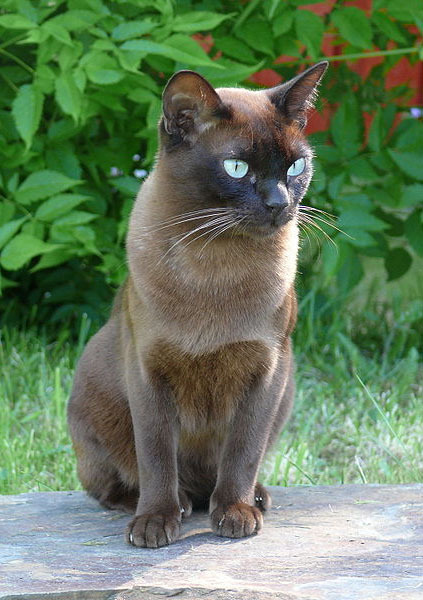 That’s why many Burmese – and half of the Tonkinese – aren’t described as points, as in “seal point” or “blue point”. They’re known as minks instead. See how little contrast the guy in the picture on the right has? He's considered a mink, not a point. Back to the other breeds for a sec: they also have allele pairs. Himalayans, for example, have the Siamese (cs cs) allele. Some Ocicats carry the Burmese allele. 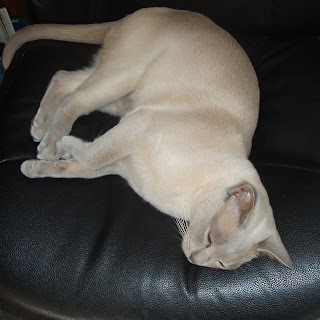 And as far as Tonkinese go – well, guys like Faraday (a platinum mink) fall in the middle. They have one of each, so a pointed Tonk will have a Siamese dominant allele pair (cs cb), whereas cats like Faraday who are minks will have a Burmese dominant allele pair (cb cs). Oooookay. Done with the hard science. Back to the cool stuff. Genetically, Maxwell's a solid grey kitty. Faraday's silver. And Ryker? He'd be dark brown. 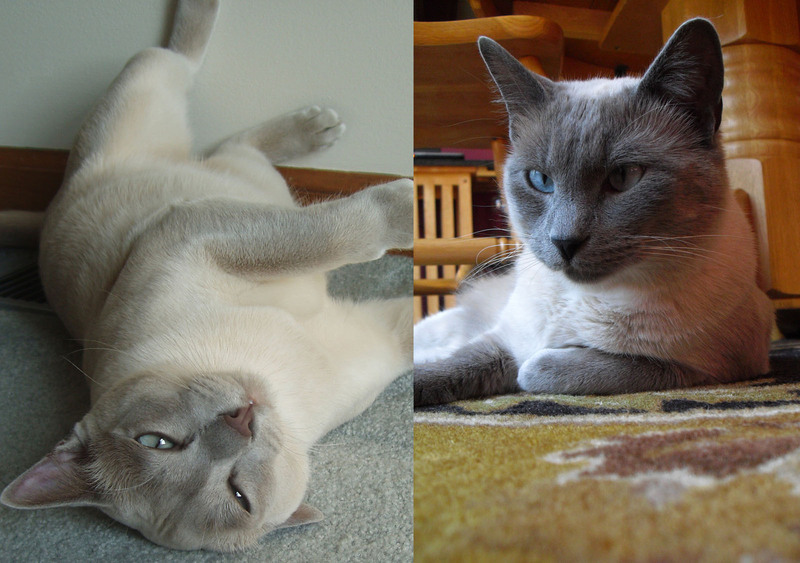 Caleb, Ryker's older brother and a seal point Siamese – well, genetically he was a black cat... with alleles. Interesting to think about, no? "Ocular pigmentation in white and Siamese cats," Investigative Ophthalmology & Visual Science, 1980 May;19(5):475-86. Very cool..... mom finds this stuff very interesting. And the whole cat genetics thing too. Like: Allie the mom cat was black so mom expected black kittens - nope 5 brown tabbies and a gray tabby. And she had has litters with tabbies and a siamese pointed mix just thrown in for flavor. :) Gotta keep people guessing. Yes, when I was a kid we had a dilute tortie who had 6 kittens, two solids of each of her colors: white, orange and gray! Interesting genetics lesson. Thank you and have a good Monday! That's pretty neat stuff, I think. Now... how 'bout those calicos & torties? How do you explain THEM? Sounds like another great Medical Issues Monday topic - we'll get to crackin' da whip on Mommy right away!! That was very interesting.. M has always loved the oriental line - Burmese, Siamese, all of them. in fact, she's always wanted one, but ended up with two blacks and two gray kitties instead. We learned a lot from reading the above. Thanks for sharing. COOL! Our tortielicious May Ling has some Meezer in her and she gets lighter in the summertime, too. Mommy is going to pay attention and try to get some comparison photos. That was very informative! What about tuxie moggies like Austin who are black and white? I notice he is actually copper coloured in a certain light!!! After writing this, Allie insisted she have her due, so look for another article talking about exactly that! What makes a moggie a tux? We have the scoop! MOL! Wow, you found something my human didn't know! And she thinks she knows everything. I, of course, DO know everything! FaRADaY: I know what you mean! *sigh* If they'd only listen to us more often. I yowl and yowl and yowl and NO ONE listens! Well WE are gonna try ta keep cool so we can keep our dark points! This is sooo cool! Me loves to reads about Siamese! Now me knows why me gets a "tan"in the summer! And Mommy was quite interested too. she likes genetic stuff being a red head. 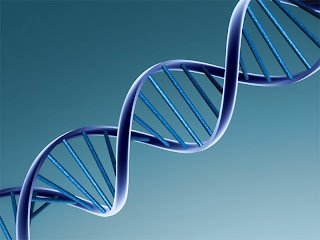 Question: why is the "Siamese dominant allele pair (cs cb)" different from the "Burmese dominant allele pair (cb cs)". Why does the order matter? Or is that just a typo? Nope, it's not a typo. From what I understand (and your mom's the expert in this field, not me!!) instead of a Siamese/Siamese allele pair, (cs cs) a Tonk will have either a Siamese allele and a Burmese allele where the Siamese allele is dominant (designation probably better stated as cS cb) or they'll have a Burmese allele dominant to a Siamese allele (cB cs). Much clearer now :) Mommy's still hasn't found all her books, she's going to read about this when she finds her cat genetics book. She's wondering whether maybe imprinting plays a role. Does it make a difference whether the mother or the father is Siamese (or Burmese)? I love this post, so interesting! Many, many years ago, my Mommeh had a Siamese who sometimes got feline herpes in his eye when he was stressed. After he got better a week or so later, he would grow a circle of white fur around his eye! The heat from the inflammation must have caused the fur to temporarily lighten. Wow, what an interesting observation, Daisy. Isn't it fun when things make sense, even if it's years later? Purrrrrrrrrrrrrrs. I agree with MizzBassie! What a cool observation! Holy cow what a cool post!!! I did a little reading when about albino cats when Casper came to live with us because of the white cat/deaf thing. I thought he was an albino but that was wrong, he is what is called Dominant White which means he has a gene that masks all other colours whereas albinos are technically "colour absent"!!! Exactly! We're giving Allie her turn soon and her genes relate directly to Casper's, as there are 3 different types of genes like his "W" masking gene! Cool stuff, huh! Thank you for this great post! Now I'm wondering if meezers who live in colder climates are darker than those who live in hotter ones...or is it all sort of relative? Imagine a series of time-lapse photos that show a kitty darkening or lightening over time--it would be like a feline sunrise (or sunset!). Thanks again for the inspiration! Nice to meet you, and thanks so much for posting! Interesting thought about colder climates. A cat's weight can impact their color, too. That insulating layer of fat can provide enough of a temperature drop to turn them darker, too! Very interesting post! My mama cat Sugar is a flame point (white with orange points). She had two male kittens who were born all white and eventually developed orange point too! Whew, now our heads have way too much in them because we just read JaneA's post about orange girl cats. I've noticed a number of my black cats with "hidden points" or who appear solid black but in the sun have mahogany torsos and sable points. In addition, Mimi, in particular, mahogany black, has many traits of Burmese cat, and a few she doesn't show up in two of her adult kittens. On top of that our Kelly, a tortie, has a very Oriental build and a very Siamese voice. Who knows? I had heard once that because Siamese are so distinctive and the breed has been around for so long and popular as a pet, the genes show up everywhere. LOL! I know what you mean. Wasn't JaneA's post interesting? I think that color coding shows up everywhere too. Mimi's such a lovely girl! I can see where she'd have Burmese in her, from the pics you've posted. I'll bet those highlights would be hard to capture - but if you do please let me know - I'd love to see them! Wow! I've always wondered why Starla's fur grows back darker when a patch comes off in brushing. She gets bad flea dermatitis and sheds patches, then they grow back a shade or two darker (camel rather than cream). Now it makes sense! Thank you!